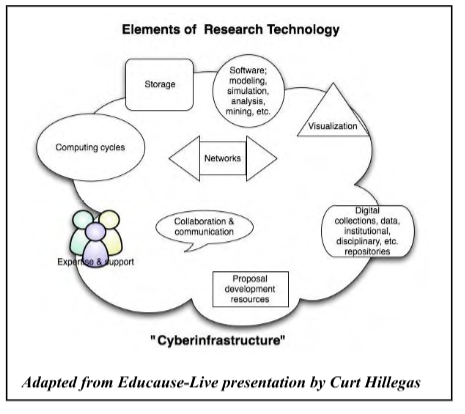 Cyberinfrastructure consists of computing systems, data storage systems, data repositories and advanced instruments, visualization environments, and people, all linked together by software and advanced networks to improve scholarly productivity and enable breakthroughs not otherwise possible. The Cyberinfrastructure services are available to UCSC faculty, graduate students, researchers, and for undergraduates with a faculty sponsor. Consultation on your research needs is no charge. Machines hosted in the campus Data Center can use the Science DMZ at no charge. There will be a one-time and ongoing costs for direct connections to the Science DMZ (Cyberinfrastructure research network) outside of the campus Data Center. STEP 1: Contact the ITS Academic Divisional Computing (ADC) team to help you identify and plan for possible computing solutions for your research project needs. 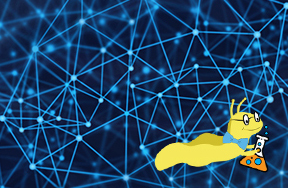 In recognizing deep interdependency of computational, network, and storage services, ADC partners with the campus Data Center, Network Operations, and Research and Faculty Partnerships to work on a coordinated approach to service development, consultation and support of your research needs. Science DMZ offers a network environment that is tailored to the needs of high performance science applications, including large data transfers, remote experiment control, and data visualization. It addresses common network performance problems for participating research institutions. File Transfer Service Globus is a transfer service that provides secure, high-performance file transfer and synchronization between endpoints. This allows you to securely share your data with other Globus users. Network Monitoring perfSONAR is an open-source toolkit for end-to-end monitoring and troubleshooting of high-performance networks. High-performance Computing (HPC) Hummingbird is the campus open access computational cluster. It has a number of preinstalled software packages that are used in the sciences and engineering. The cluster can also be used for other applications in Social Sciences, Humanities and Arts. Many users compile software themselves in their home directories, this is useful for those who want to run a specialized environment. ITS can also assist with requests for hosting at the San Diego Super Computer Data Center. Ceph Shared Storage for data transfer and data warehousing is being piloted by the Science DMZ team. The VizWall is a 14'x4' screen installation that enables large scale presentation of visual materials or simultaneous interaction with multiple pieces of digital content offering space to visualize research and create interactive digital media. The current VizWall is installed at McHenry Library room 350. Research Cluster Support: Support for research clusters in the divisions ranges from troubleshooting systems run by researchers to managing compute clusters with hundreds of nodes. Research Software: Support for research software includes installation, configuration and vendor relations in support of commercial and/or open source software packages used in research. Research Imaging: Divisions who offer research imaging will provide an operating system image for your research machine distinct from the operating systems (Mac and Windows) supported by the ITS standard desktop support service. The campus Cyberinfrastructure teams will provide best-effort support for your research efforts. If you are working with sensitive data, you have special security requirements which should be covered in your data management plan, and may not be met by this service. Consult with us about how to provide the needed protections while taking advantage of the Cyberinfrastructure components. The Cyberinfrastructure, its components, and related services are always appropriate for non-sensitive data. Traffic on the Science DMZ (the research network for the Cyberinfrastructure) is monitored by the campus Information Security team, and system owners will be notified of identified security issues. For hosts in the Data Center, additional security hardening is provided by the standard tools including application scanning, packet capture, and IDS/IPS; centralized logging and authenticated server scanning are also available.